The labyrinth at the Chautauqua Institution lies partly in shade and partly in sun. Photo from the Chautauqua Institution. Labyrinths date back thousands of years and have been used in many cultures. During Medieval times, many Christian churches incorporated labyrinths into floor designs. Today garden labyrinths are getting new attention at places of worship, medical centers, conference centers, parks, colleges and even backyards. 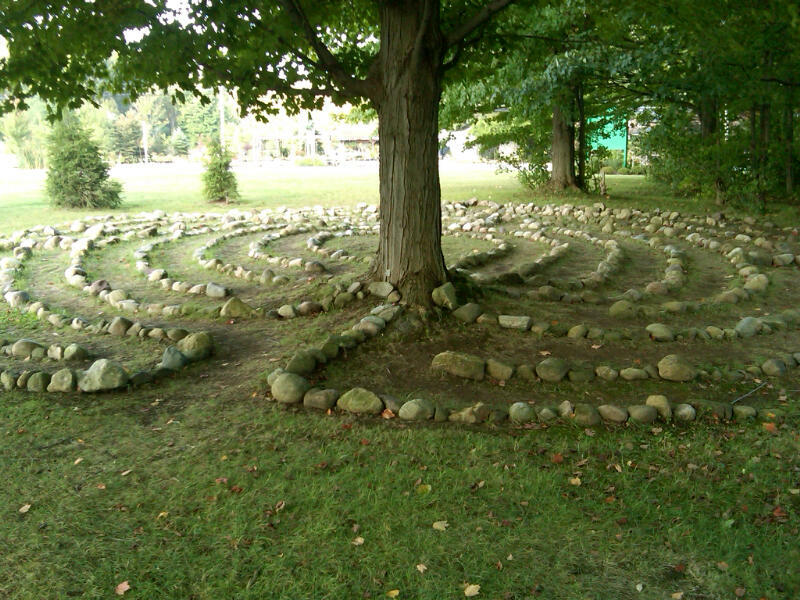 World Labyrinth Day is Saturday, May 5, so this seems a good time to introduce you to some local labyrinths: one at Unity Church in Buffalo, one at the Chautauqua Institution and one in the yard of Suzanna Drozd-Kowalski of Corfu. You don’t have to create a labyrinth in your own yard; you can explore these spiritual landscape features in many spots all over Western New York. You can search for a labyrinth near you at the World-wide Labyrinth Locator. A labyrinth is a meditation tool. “People have a sense that it’s ‘New-Agey,’ but labyrinths are classical,” said Debra Dinnocenzo, labyrinth coordinator for the Department of Religion at Chautauqua Institution. “They have been used extensively in the Christian tradition.” One of the most famous labyrinths is in the Chartres Cathedral in France, built around 1200 A.D.
You can find labyrinth designs on pottery, tablets and tiles dating back 4000 years, she said. In Native American culture it is called the Medicine Wheel and Man in the Maze. The Celts described it as the Never Ending Circle. It is also called the Kabala in mystical Judaism. One feature all labyrinths share is that they have one path that winds in a circuitous way to the center. The labyrinth is not a maze; there are no tricks or dead ends. The entrance is the same as the exit; you can never get lost in a labyrinth. The path is in full view, which allows a person to be quiet and focus internally. Steve Thoren, team leader of the Peace Park project at Unity Church in Buffalo, walks the church's labyrinth that was completed in December. Photo by Connie Oswald Stofko. The Rev. Allaurah Olson, minister emerita at Unity Church, offered some suggestions for walking a labyrinth. The entrance is a place to stop, reflect and set an intention for the spiritual walk. As you walk, focus on the intention. At the center, you can take as long as you wish and be open and receptive to spiritual guidance. On the return journey, focus on what you bring from the center. However, everyone interviewed for this article agreed that there is no right or wrong way to walk a labyrinth. If you want, you can run or skip or play a flute. You can use a labyrinth in whatever way works for you. 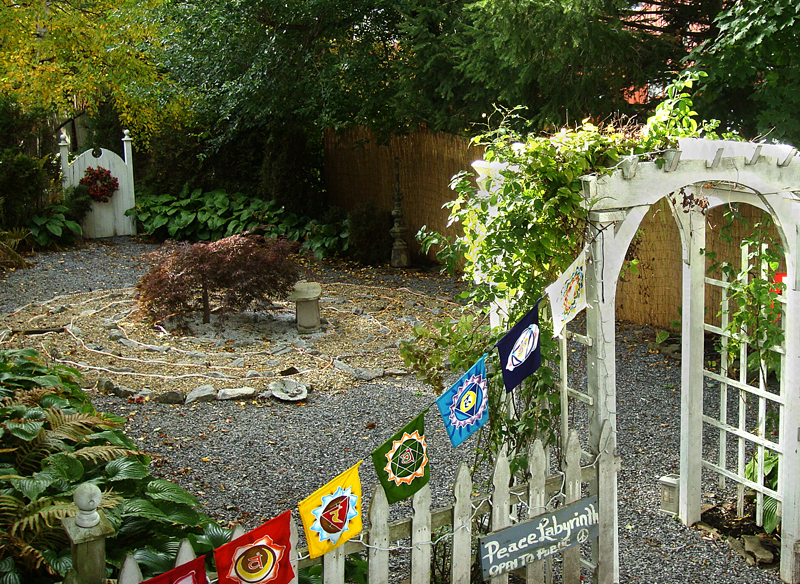 An open gateway welcomes visitors to the labyrinth in the yard of Suzanna Drozd-Kowalski of Corfu. Photo by Suzanna Drozd-Kowalski. About eight years ago, Debra Dinnocenzo and Harriette Royer of Rochester, one of the instructors of classes related to labyrinths at Chautauqua, secured space for a permanent labyrinth there. The labyrinth is based on a design by Lisa Moriarty. As Royer made calculations to lay it out, they made a discovery: A tree was in the way! Rather than hack it down, they incorporated the tree into the design, which is unusual, she said. You can see it in the first photo. Because of the tree, part of the labyrinth is in the shade and part is in the light. The earth is uneven, so sometimes you are walking downhill and sometimes you are walking slightly uphill. These physical features provide interesting metaphors for a spirtual journey, Dinnocenzo noted. The beautiful rocks that line the paths were donated and installed by a local farmer, she said. They mow the area once at the beginning of the season, and the foot traffic keeps the grass down after that. There are so many talks and concerts happening at Chautauqua during the summer that people can feel guilty to just sit on their porch and relax. Dinnocenzo encourages them to walk the labyrinth. Rope lights illuminate this Corfu labyrinth. Photo by Suzanna Drozd-Kowalski. 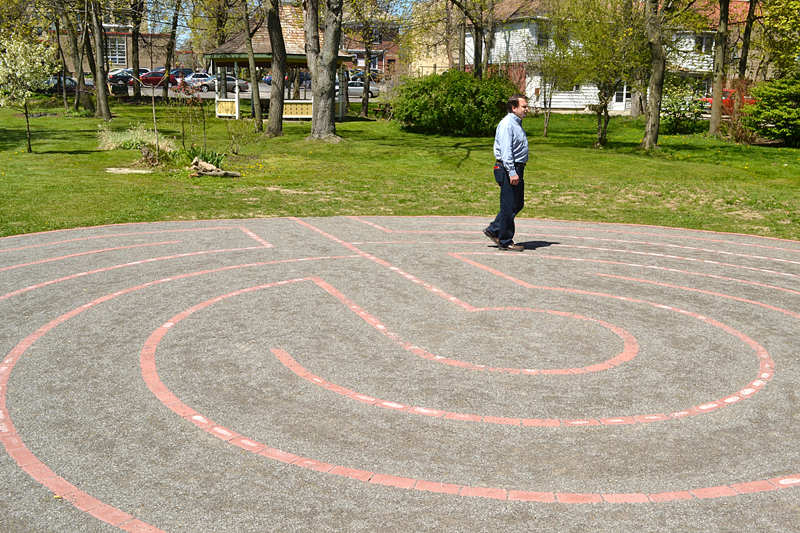 Unity Church had its labyrinth professionally installed. It was completed in December. The path is wide enough for a wheelchair or walker. It is made of crushed stone and bordered with red bricks. For a donation, a brick can be inscribed with your name or a loved one’s name. The labyrinth is located on what was once a vacant lot on Linwood behind the church, explained Steve Thoren, team leader of the Peace Park project at the church. The church decided to create a Peace Park, where people in the community could come to find peace and relaxation. The first feature of the park was the yellow gazebo, which you can see beyond the labyrinth in the second photo. A group is now planning gardens for the park. Suzanna Drozd-Kowalski has walked labyrinths in Germany, Italy and England. She has drawn labyrinths in the sand at beaches in Mexico and Fiji. And she has built a labyrinth in her backyard at 10 Maple Ave., Corfu, which is always open to the public. She dedicated it to her mother, who was ill at the time, and her son-in-law, who was deployed in Iraq. 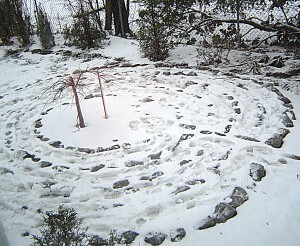 Unless the snow gets too deep, the labyrinth in Corfu can be walked during the winter. Photo by Suzanna Drozd-Kowalski. “He came back safely from Iraq to cut the ribbon, and she was on the porch,” said Drozd-Kowalski. Drozd-Kowalski comes from a long line of gardeners. She is a past president of the Corfu Garden Club, so the labyrinth is surrounded with plants. There are antique roses, clematis, ostrich ferns that get four feet high and hostas with white flowers that smell like orange blossoms. Statues are used in the garden as well. It’s easy to build a labyrinth, she said. You can find many diagrams on the Internet and in books. 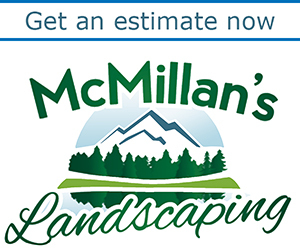 Lay down landscape fabric to keep the weeds down. Then spray your design with the paint they use to draw lines on sports fields. She initially used mulch on the surface, but it breaks down and needs to be replaced, so she now uses a stone surface. If you collect rocks in your travels, you could use them in your labyrinth. Rope lights illuminate the path at night. “It’s a very tranquil place,” she said. As part of World Labyrinth Day, Unity Church will participate in the “Walk as One at 1” event, where people all over the planet walk a labyrinth at 1 p.m. in their time zone. The event will be held in Unity Peace Park, which is behind the church, 1243 Delaware Ave., Buffalo. (Walk past the gazebo.) People will meet at 12:15 p.m. for a short program, then walk the labyrinth at 1 p.m. Anyone may attend. This summer, weekly “Introduction to the Labyrinth” sessions will be held at 7 p.m. Mondays, June 24 – August 25 at the Chautauqua Institution. The sessions are open to the public. The labyrinth is easily accessible from SR394, and access to the grounds of Chautauqua beyond the gates is not required. My wife and I have had a labyrinth at our previous house and we moved it to our new house. Last fall we did a complete overhall to enlarge it and to improve the flow. 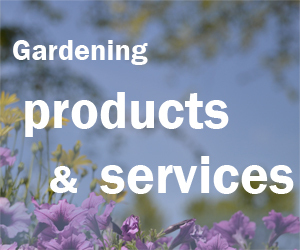 You are welcome to visit – you can see three pictures of our work at http://www.bodyglyphix.com/magicalorganicgardens.html – and look up where to find us! I did not know there was such a day as World Labyrinth Day. I especially like the one at the Chautauqua Institution. Thanks so much for linking to your photos. Before writing this story, I had no idea how popular labyrinths were! Thanks for writing. My daughter, Virginia, called me this morning to inform me about May 5th being International Labyrinth Day. I opened my email to find a message from TLS that that was true. Well, I summer in the beautiful East Town of Dunkirk in a cabin in The Labyrinthine Ways Peace Park. 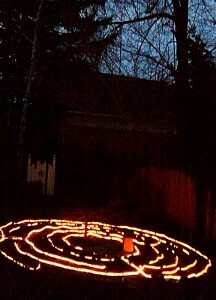 I have a rustic “cross” labyrinth and a spiral labyrinth made out of mums – just greening now. The park is open from dawn to dusk from February 2 (Celtic Spring) until November 2 (Dias de los Muertos). We are located at 3829 Franklin Avenue directly across from Greenhurst Ave. (If you need a map, I suggest you google the East Town Fire Company on South Roberts Road – 14048. It is one block away and the parking lot abuts Greenhurst. Besides the labyrinths, there are about two miles of hiking trails with paths named after Gandhi, King, Bicko etc.